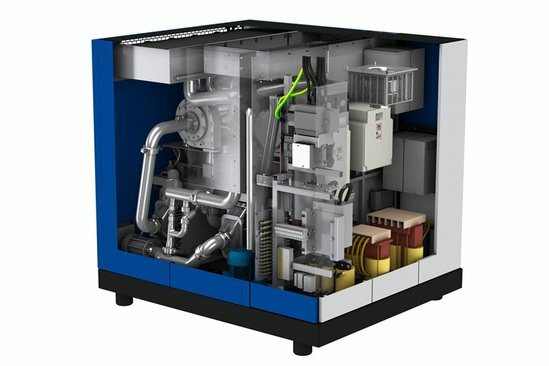 Using a high-speed, premium-efficiency motor and digitally-controlled magnetic bearings, the oil-free HSR compressor range offers excellent wire-to-air efficiency and gives the maximum amount of compressed air for energy input. The highly efficient HSR means substantial savings with lower energy consumption, reduced operating costs, lower maintenance costs and less downtime caused by breakdowns. The HSR contributes to a healthier working environment and reduces a plant’s carbon footprint. Thanks to the direct drive and magnetic bearings, there is no need for mechanical gears, bearings and seals. There is no oil or other liquid lubricant anywhere in the product. 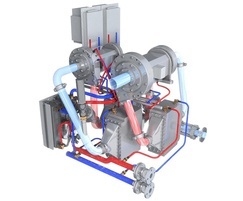 The HSR is cooled by water; the advantage is that both the heat generated by the compression and drive-related losses can be recovered as usable energy. 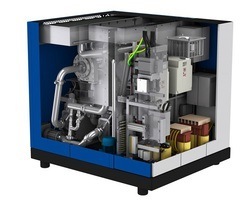 Water cooling also ensures optimal performance and generally extends the lifetime of the components. The two-stage or three-stage compression for maximum pressures of 4.5 and 9 bar (gauge) respectively is done with state-of-the-art turbo air ends, directly driven by a high-speed motor that utilises permanent magnets. For reaching the necessary speed and for flow control, one or two variable frequency drives control the motor(s). The wide flow range can be extended by applying adjustable diffuser vanes. By utilising modulating blow-off valves, the flow can be adjusted between 0 and 100%.